This week the children in House Room have been continuing their study of color mixing. We have been reading a new book called Mix it up by Herve Tullet. The book explains the process of mixing primary colors to create secondary colors and various shades. The fun, interactive reading really sparked the children’s interest, so we decided to create our own version of the book. 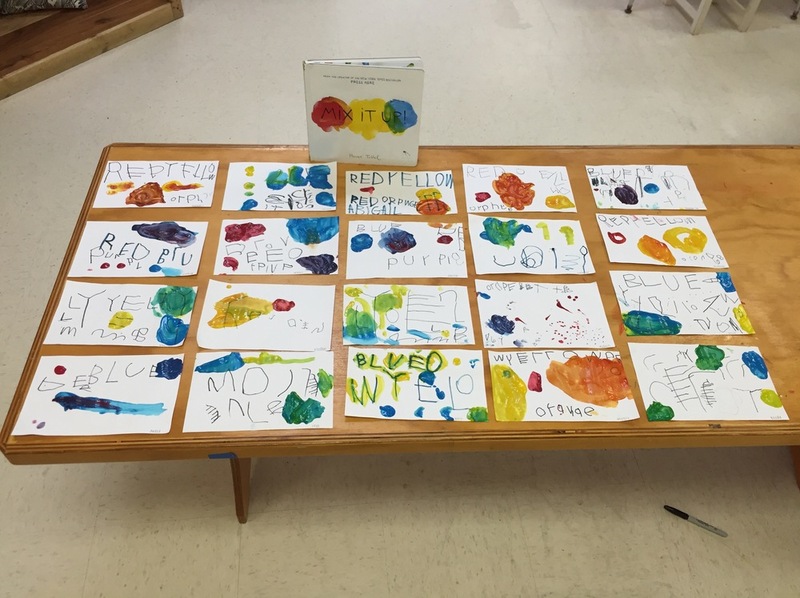 We began the process by placing all of the primary colors on a classroom table. The children then had the opportunity to test and determine which colors mix to create green, purple and orange. After mixing their colors they labeled each color with the corresponding name. · “I like making new colors"
Participating in this color mixing experience allowed the children to understand cause and effect, reminding them that their actions have the power to create change. The experience provided an explanation of why and how different colors and shades exist. 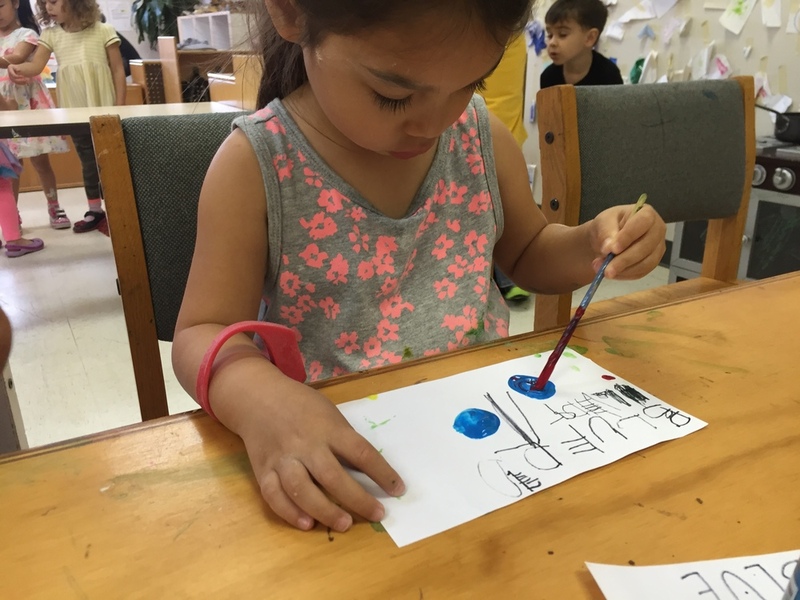 Understanding the color mixing process empowers a child by giving them the ability to create the colors they need to adequately portray their ideas and emotions. A larger variety of color options means a larger set of tools to explore imagination and express creativity. The class reading served as a sort of “roadmap” for the majority of the experience. 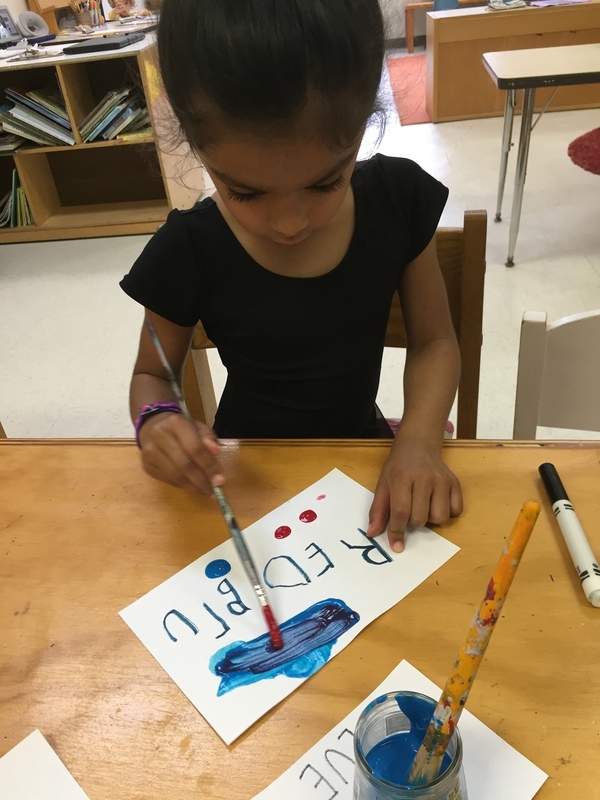 The book’s illustrations mirror a real finger-painting process and the text includes action words like “tap”, “smudge” and “shake” to describe the physical actions the children could take when mixing colors. While reading, the children were also encouraged to count and hypothesize end results in various color mixing scenarios. From a literacy standpoint, sounds of letters and words were reinforced. The actual mixing of colors exercised the children’s minds, along with their hand muscles. 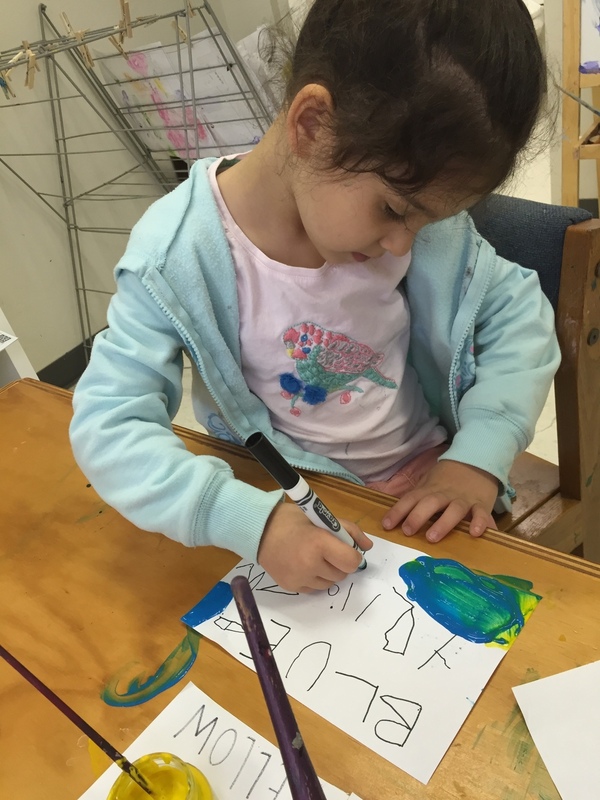 Writing the color names with a marker and handling the paintbrush both enhanced fine motor skills. 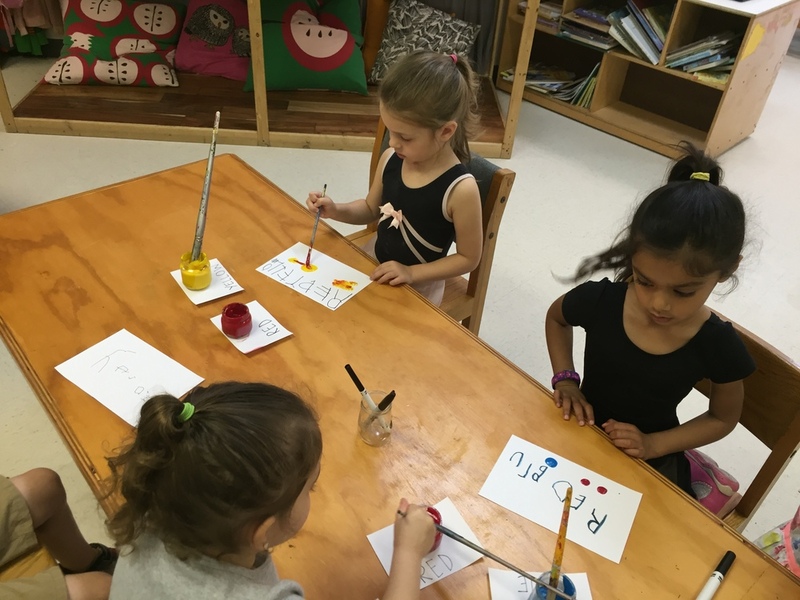 Labeling the colors allowed the children to practice letter and word recognition and further develop writing and spelling skills. 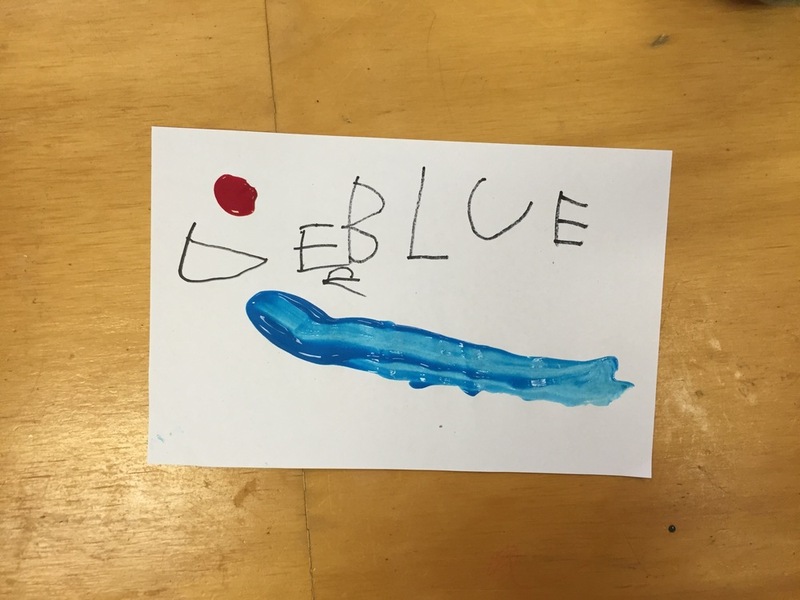 The labeling process also provided an opportunity for the children to grasp a solid understanding of word/image correspondence by matching the painted colors with their appropriate color names. Making something new gives children a sense of accomplishment and ownership. We will continue to make new paint every week, and create as many new colors as we can.